March 9, Fineko/abc.az. Today, Azerbaijani Defense Minister Colonel-General Zakir Hasanov met with a delegation headed by Georgian Defense Minister Levan Izoria. The Ministry of Defense reports that the defense ministers of the two countries held a one-on-one meeting, after which an extended meeting was held. Zakir Hasanov stressed that the strategic partnership between Azerbaijan and Georgia is at a high level and this plays an important role not only in the development of our countries, but also in ensuring security in the entire region. "Noting that the military cooperation of our countries is carried out through the security of regional economic projects, programs implemented both bilaterally and within NATO, as well as in the format of the military structures Azerbaijan-Turkey-Georgia, Colonel-General Zakir Hasanov stressed the importance of expanding spheres of activity of this cooperation," the report says. The Azerbaijani Defense Minister brought to the attention of the guests that Armenia, being an occupying country, poses a serious threat to regional security and at the state level renders continuous support to separatism. Once again expressing gratitude to the Georgian people for the support of Azerbaijan in international organizations and recognition of its territorial integrity, the minister stressed that Azerbaijan also recognizes and supports the territorial integrity of Georgia. During the meeting, the defense ministers discussed cooperation issues between the ministries in the field of verification and arms control. The sides also exchanged views on the prospects for cooperation in the military, military-technical, military-educational, military-medical spheres, joint military exercises, organization of working meetings, etc. 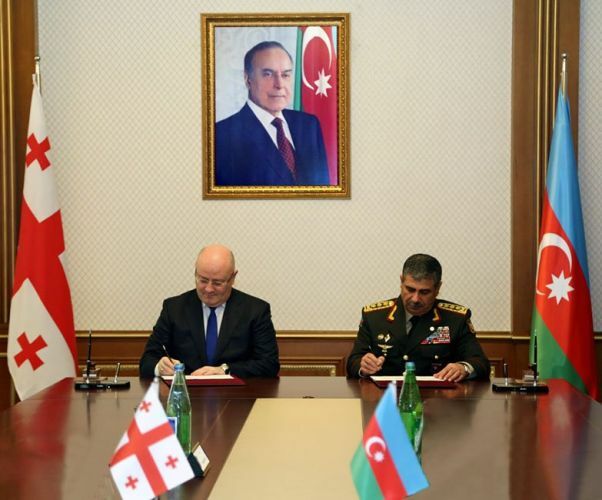 At the end of the meeting, a plan of bilateral cooperation for 2018 between the ministries of defense of Azerbaijan and Georgia was signed.